Anthurium fendleri Schott, Prodr. 468.1860. Distribution:This species is known from Venezuela, Columbia, rare in Panama. 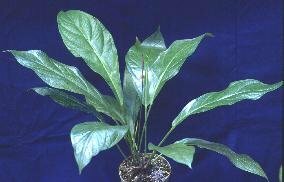 Sectional Placement: Anthurium fendleri is a member of section Pachynuerium. Description: Epiphytic, epilithic, or terrestrial, forming an open rosette, typical of the 'birdsnest' section. Stem, up to 15 cm long, 1-3cm in diameter, roots descending, pubescent; Leaves, erect and spreading; petioles D-shaped with 1-5 ribs, the blade is broadly elliptic, acuminate at the apex, usually shallowly cordate at the base. A more detailed description is available for this species in Croat's online Revision of Anthurium, Section Pachynuerium. Notes: Seems to be of easy culture in the greenhouse. This species could be a possible candidate for indoor culture due to the less humid habitat in which this species is found. This species is found from 50m - 1000m, with a few specimens found up to 2300m in dry to moist forest, on rocky outcrops, and as epiphytes. As with other Pachynuerium, this species is of relativly easy culture.